This is a a tutorial / instructional video on how to remove and install power steering pump on 2003-2007 Honda Accord 2.4L, which is the same for other Accord models 2004, 2005 & 2006 DX, LX & EX by young mechanic Aiman. The guide is also applicable to other Honda models Civic, CRV, Element, Odyssey etc.. Replacing a power steering pump can be a good DIY repair for the advanced DIYer. This task will require draining and refilling the power steering system, and bleeding the power system to purge any trapped air. A torque wrench is necessary for the high side line in many occasions, as the brass washers must be tightened to specification to prevent leaks. If the power steering pump mounting bolts are integrated into other components, and many components must be removed, consider letting a certified technician handle this job to prevent damage to the engine. Steps:To replace the power steering pump, the power steering fluid will need to be drained from the system. The serpentine or power steering belt will be removed from the pump pulley, the steering hoses will be removed from the pump, and the pump will be unbolted from its mounting position on the engine block. A new pump will then be installed, the lines attached, the belt reinstalled, and the fluid refilled. The system will be bled of air, and checked for proper functionality to ensure a complete repair. What is a power steering pump? Hydraulic power steering systems use a pump to provide pressurized hydraulic fluid so work can be done. The power steering pump pressurizes and circulates power steering fluid through the power steering hydraulic system, allowing the steering wheel to turn with greater ease. How does the power steering pump work? Power steering pumps create hydraulic pressure, and the hoses transfer the pressure to the steering gear, where it will be used to assist the driver turning the wheels, and the other hose will return the used fluid to be pressurized. This process happens continuously, and the power steering pump will pressurize fluid any time the engine is running. 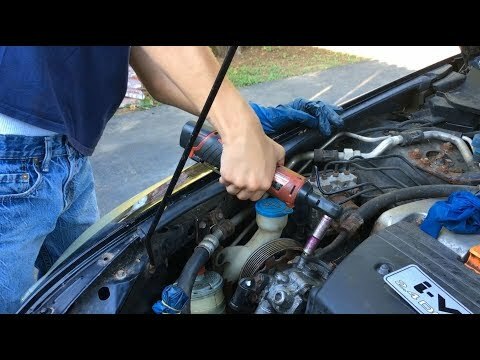 Good Video young man, i'm a mechanic myself for many years, not on cars but Industrial Diesels and any piece of machinery you could imagine on a offshore drilling rig, but cars are my hobby and this video describes and shows very clearly how to remove and replace a PS pump on my Honda, job I need to do soon as it's leaking. Do you need to Bleed it to get any air out? the clearest ever video.. Will need to do this on my Power Steering pump..
Great job, you have the best and easiest tutorial.